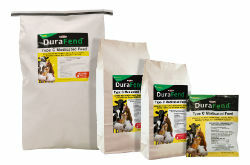 DuraFend Multi-Species Medicated Dewormer is indicated for the control and removal of worms in a broad range of animals. Pellets may be top dressed or blended with feed. Type C Medicated Feed equivalent to SAFE-GUARD® (fenbendazole) 0.5% Medicated Dewormer Pellets. Multi-species label: Beef and dairy cattle, horses, zoo and wildlife animals. Removes and controls a variety of worms including: Lungworms, Stomach worms, Intestinal worms, Bankrupt worms as well as other worms. No milk withdrawal period for dairy cattle. Scoop included in the 5 lb, 10 lb, and 25 lb.